This little video is a top speed and acceleration comparison between the hottest muscle/pony car offerings from the big three makers. The 2013 Shelby Mustang GT500, 2018 Dodge Demon and 2017 Camaro ZL1. All three are vastly different beasts, all very capable in their own rights. 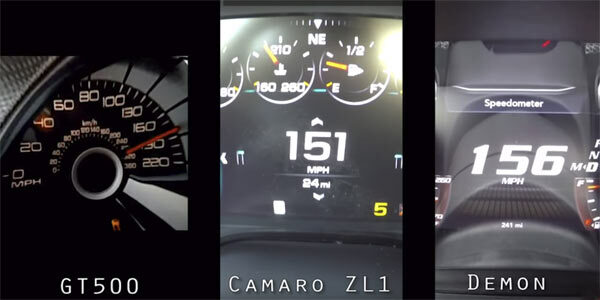 The video is just a speed of view from each car during the run(s) with the Demon hitting 164mph, the ZL1 173mph in 5th gear and the GT500 looking like it’s topping 190mph+. All have vastly different horsepower ratings with the GT500 having 900HP, the Demon 840HP and the ZL1 650HP. Clearly, this isn’t a scientific head-to-head, as they all have vastly different horsepower ratings and specialisms ( dragstrip, track racing monsters) and no mention of the setup on each car, so treat this as just a fun overview of each vehicle and what it can do. In any case, given the preference which one would you choose? Ok, what the hell are u thinking?